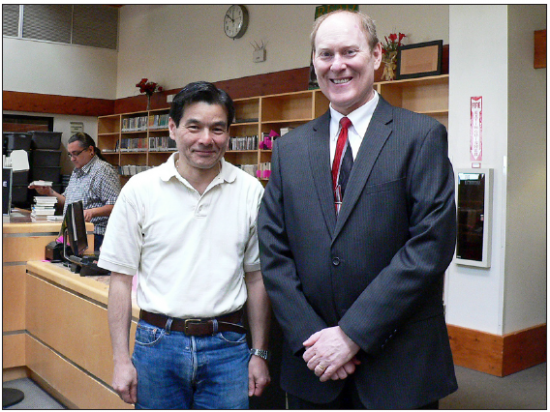 Senior Librarian Jim Sherod (left) is joined by Edwin Barker, president of the Friends of Little Tokyo Branch Library. Jim Sherod was recently appointed the new senior librarian at the Little Tokyo Branch Library. He replaces Hitoshi Ohta, who is now head of Los Angeles Public Library’s Cataloging Department. Ohta was at Little Tokyo for five and a half years. “I am looking forward to doing my best to serve this community,” said Sherod. His goals for the library include being responsive to the community’s information needs, making people more aware of the library, providing relevant programming, and keeping the collection dynamic. He is married with two daughters and likes to read books, hike, walk, play tennis, and surf. Besides Sherod, the Little Tokyo Library welcomes a new half-time public service librarian, Danica Sheridan, and an afternoon security guard from 1:30 to 5:30 p.m. each day. John Szabo, from the Atlanta-Fulton Public Library system, is the new city librarian. Because of Measure L, passed by Los Angeles voters, the Little Tokyo Library has reopened two additional nights and Friday mornings. The Friends of Little Tokyo Branch Library support its collections and community outreach programs. For the past few years, the group has raised funds to purchase Japanese-language magazines for the library. The 2013 officers are Edwin Barker, president; Irene Murashige, second vice president; Kiku Matsumura, third vice president; Ron Hirano, recording secretary; Jean Miyamoto, corresponding secretary; and Larry Kuromiya, treasurer. Board members are Ann Kuromiya, Janet Minami, Jim Sherod, Yoshiko Solomon, Juliet Wong, and Masako Yasui. The Friends invite everyone to the library’s monthly sale of used books, DVDs, collectibles, and baked goods. It’s held every fourth Saturday of the month in the library’s Community Room from 1 to 4 p.m. Books in Japanese and English are priced from 25 cents to $1. Everyone is also encouraged to attend the Nisei Week Quilt Show in August, sponsored by the Little Tokyo Library Quilters, and the Friends’ Author Recognition Luncheon in October.